Cebu as the oldest city and first capital of the Philippines, has turned into a global center for shipping, furniture-making, processing services for business, heavy industry and tourism. 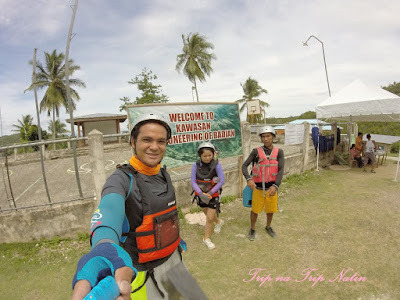 It has been one of the top destination of tourists in the Philippines because of its known beautiful islands, beaches, churches, resorts, and historical landmarks. Currently, Cebu has opened new door of exploration which involves distinct and adventurous activities. 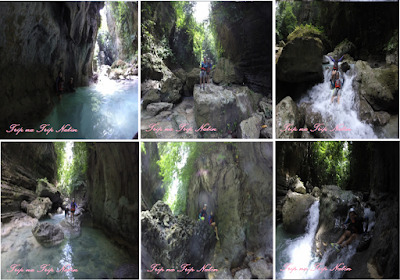 This newly discovered interest is called Kawasan Canyoneering, located at Badian Cebu- a municipality of the Province which is 3hours away from the South Terminal Bus in Cebu City. Canyoneering is a sport involving travelling down creeks and streams within a canyon. The activity includes rappelling, rafting and several waterfall jumping. From La Playa Beach Resort we’ve travelled to Canyoneering jump-off were we’ve registered and started our journey to Kawasan Falls. "An approximate of 15minutes hike was made before we’ve gone to the water activities." Upon reaching the water stretch of the falls, we were amazed by the rock formation and clearness of the water surrounding us. The water is cool and raging. Don’t haste to finish the activity so soon. Try to spend time swimming while enjoying the cool stream of water with your friends and/or love ones. This is the perfect time to relax from the busy and stressful life at work and to bond with family and friends. Sliding on mini-falls and jumping on cliffs are what made this activity adventurous and much more exciting. Boys were able to show their braveness by portraying a fearless individual who’s never been afraid of heights and challenges. Girls, on the other hand, are the ones who scream a lotJ. Please keep in mind that you should always listen to your guide’s instructions before takeoff from any jumping areas for safety pruposes. For those who are in doubt if this activity can be performed by those who do not know how to swim, my answer would certainly be YES. 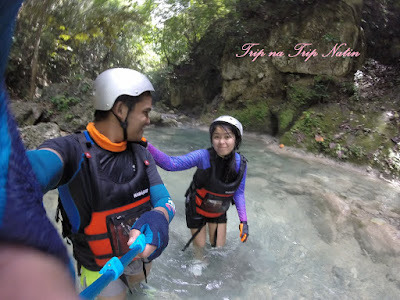 My GF don’t know how to swim, but she has conquered Kawasan Falls’ Canyoneering; thanks to her life jacket J. The Mini-Daredevil Jump. I called it daredevil jump because this involves strong will and very high adrenaline-rush activity. Only few tourists tried this. The jumping area has a height of more or less 15 meters and requires you to be a little more distant before you take off to avoid being hit by any rocks nearby. 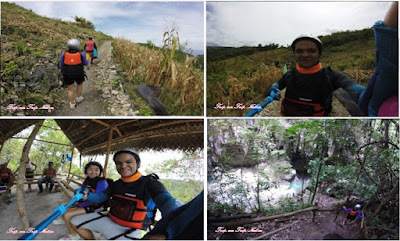 Canyoneering Package is only Php 1,500 each minimum are two person but you can still avail if you are solo traveler just leave us message so we can arrange you with other tourists.